The Harper government’s proposed anti-terror bill, Bill C-51, would make it easier for federal departments and agencies to share information on widely-defined national security grounds. 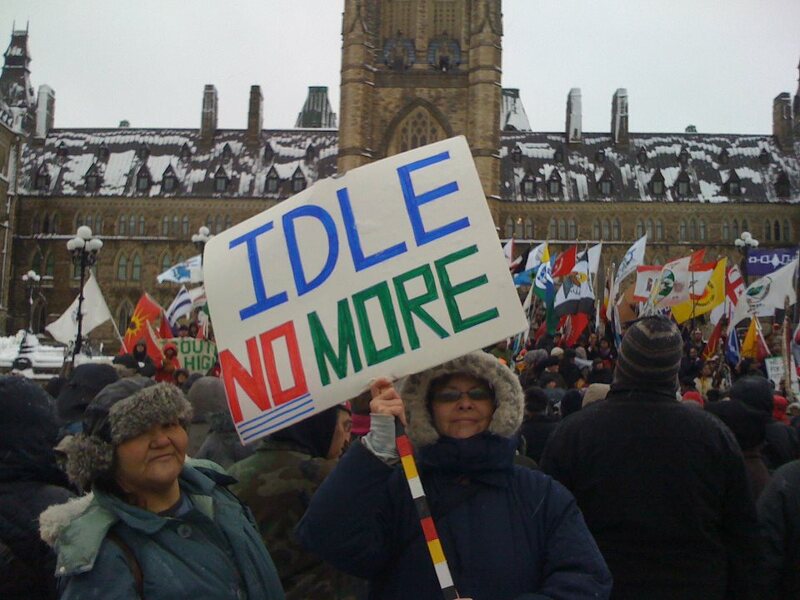 The Public Safety documents stem from surveillance activity around the Idle No More movement as it was reaching its apex between December 2012 and January 2013. The documents focus on a number of protests planned between Dec. 19 and Dec. 23, 2012. The documents show that Aboriginal Affairs not only shared and received protest information from the Canadian Security Intelligence Agency on protests, it also supplied details about a meeting between government officials and First Nation leaders. The information was passed on to the Integrated Terrorism Assessment Centre (ITAC), which includes CSIS and police services across the country. “(Aboriginal Affairs) Quebec (branch) reported on Dec. 18 that a meeting is to occur in Ottawa on 20 Dec between government officials and First Nation leaders,” said one document titled, Planned First Nations Demonstrations. “(Government Operations Centre) has consulted with ITAC, RCMP, AANDC, (Transport Canada) and (Public Safety) Communications. In another document titled, Update on “FN” Protests, Aboriginal Affairs is asked to provide information on Attawapiskat First Nation’s housing situation and its state of emergency. Attawapiskat Chief Theresa Spence was in the midst of a liquids-only fast on Victoria Island in Ottawa during this time. The documents also reveal information was directly exchanged between Aboriginal Affairs and CSIS. While there were no “indicators of potential violence” specifically for the Ottawa-based action, security officials in Public Safety were convinced a possibility of violence existed because some “youth” mentioned the 1990 Oka crisis in online discussions. The Oka crisis featured armed Mohawk warriors facing about 3,000 Canadian soldiers in a stand-off to protect burial grounds from being turned into golf greens near Montreal. Aboriginal Affairs officials also provided on-the-ground intelligence about Idle No More protests to the Government Operations Centre (GOC), which is the federal nerve-centre created to deal with threats of a national scale. Ottawa-based human rights lawyer Paul Champ said the leap security officials made in assuming a potential of violence based on online references to Oka shows how little they understood First Nations people. Champ said the documents also show how easily it is for security personnel to assume the threat of violence. Under Bill C-51, police can execute arrests and hold people on the belief that a terror act “may” be committed, instead of “will” be committed, which is the current standard. Bill C-51, if passed, would make it illegal to promote acts of terror online. The documents show Aboriginal Affairs is currently willing to share a wide range of information with other federal agencies and departments. Aboriginal Affairs officials have already been caught sorting through the Indian status file of First Nations child advocate Cindy Blackstock. Indian status files contain information on an individual’s family links. “Bill C-51 would allow Aboriginal Affairs to share that information with CSIS if that would help CSIS with investigations of threats to national security,” said Champ, who represented Blackstock in her human rights complaints against Ottawa over the underfunding of on-reserve child services. Aboriginal Affairs officials not only sifted through Blackstock’s Indian status records, but also monitored her online activities and public appearances. The documents undercut a claim made during a House of Commons committee hearings last week by Roxanne James, the parliamentary secretary for Public Safety. During an appearance by Assembly of First Nations National Chief Perry Bellegarde before the MPs committee studying Bill C-51, James claimed First Nations had never been considered a security threat by the Canadian state in her life time. She also claimed First Nations would never have been flagged under the proposed increased information sharing powers provided by Bill C-51. APTN has reported on how the GOC prepared to deal with fallout from the 2013 RCMP raid on a Mi’kmaq anti-fracking camp near Elsipogtog in New Brunswick. APTN also reported the Canadian Forces counter-intelligence arm also monitored the situation in Elsipogtog. Aboriginal Affairs and CSIS did not return a request for comment as of this article’s posting. Posted on March 19, 2015, in State Security Forces and tagged Aboriginal Affairs and Northern Development, Canadian Security Intelligence Service, csis, Government Operations Centre, Idle No More, native protests, surveillance. Bookmark the permalink. 1 Comment.